Hartford Medical Society – The Hartford Medical Society (HMS) is a membership organization for physicians in clinical practice, in research/teaching, in training and others that have an interest in things medical who work or reside in Greater Hartford. The Hartford Medical Society (HMS) is a membership organization for physicians in clinical practice, in research/teaching, in training and others that have an interest in things medical who work or reside in Greater Hartford. Since its inception in 1846, over 170 years ago, the Hartford Medical Society has espoused a three-pronged mission of learning, camaraderie and community service. Today we support the same objectives by sponsoring lectures, social activities, and outreach in the form of scholarships, mentoring, and medical exhibits. Our historical library, with volumes dating to the early 1500’s, is housed at the University of Connecticut Health Center. It is a very special collection and a researcher’s delight. We invite you to enjoy our offerings – library, lectures, social events – and to consider joining us. Visit the HMS Library website anytime. Ever wonder what it would be like to travel the world? At this HMS Dine and Learn you will hear about the adventure of a lifetime from our very own John and Marylou Welch! Learn more about the May 1 Dine and Learn here or register now. HMS welcomed Dr. Bruce Koeppen to speak in 2013 as the Frank H. Netter MD School of Medicine at Quinnipiac University welcomed its charter class of 60 students. There’s been many changes and great growth at the school with the new incoming class welcomed 91 students chosen from 7,556 applicants. Learn more about the newest medical school in Connecticut from its dean! Learn more here or register now. Membership for physicians and clinical practice, research/teaching, and training, and all others that have an interest in things medical is only $100 a year. Curious about the HMS Library? Want to look around without leaving your living room? You can see more here. HMS Librarian Jennifer Miglus is featured in the podcast, Grating the Nutmeg Episode 58: Keeping It Clean in World War I. In the 1910s, a group of Connecticut reformers formed a society aimed at solving a growing crisis – the spread of venereal diseases. 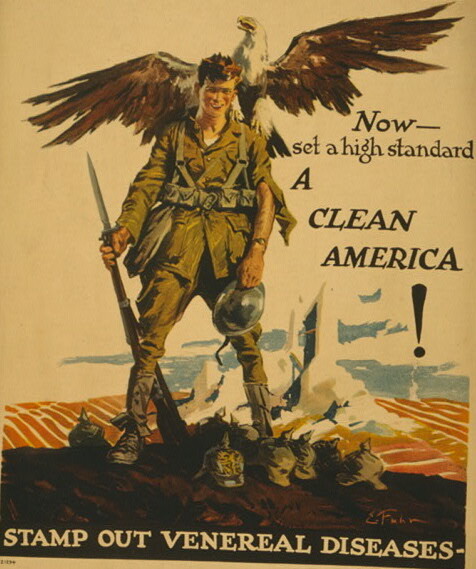 The United States’ entry into WWI provided this so-called “social hygienist” movement with an unprecedented opportunity to influence the sexual mores of Americans. In this episode produced by Connecticut Historical Society’s Natalie Belanger, Natalie tells us how that worked out for these well-intentioned reformers—especially one George P. Thayer, a crusader for clean living that saw a little more in France than he’d bargained for. Read more about Connecticut in World War I at ctexplored.org in the Spring 2017 and Winter 2014/2015 issues. Listen to this podcast here.